It is not by chance that the Bahamas has, over numerous decades, distinguished itself as a leading international financial centre. Much thought, effort and focused attention have gone into producing the ideal environment in order to position the Bahamas as the pre-eminent offshore tax-neutral jurisdiction with the physical resources and legislative framework necessary to attract the business of the ultra-high net worth individuals and families. In addition, its progressive residency regime and available physical resources make it possible for the ultra-high net worth and high net worth individuals to follow their wealth and to live where they bank. With its close proximity to the US, and established links and direct air lifts to North American, European and Latin American markets, the Bahamas' geographic advantage is unequalled by its competitors. The Bahamas' mature and sophisticated financial services industry is home to a number of the world's largest wealth providers but there are also a number of well-capitalised and financially strong boutique institutions available for those who prefer a more personalised relationship. The industry is serviced by a well-trained cadre of professionals, from private bankers to lawyers and accountants, and there is no shortage of available professional talent. Further, with the increasing move towards liberalisation of the Bahamas' immigration regime, the ability to import the necessary talent to service the needs of the ultra-high net worth and high net worth individuals is becoming increasingly easy. Location: the Bahamas is situated a few miles off the coast of the United States, making it a hub for regional investment and business in the United States, Canada and Central and South America. Political and economic stability: the Bahamas has more than 280 years of uninterrupted parliamentary democracy. The Bahamas ushered in a new government in May 2017 following a highly anticipated general election, but that has not affected its stance as the mecca in the financial services industry. Additionally, its currency is on a par with the US dollar. Wealth- and asset-management services: the Bahamas offers a significant number of financial institutions, delivering services including banking, private banking and trust services, accounting and legal services, e-commerce, insurance, and corporate and shipping registries. Additionally, there is in excess of 700 funds that are licensed in the Bahamas, with assets under management totalling over B$200 billion. Infrastructure: the Bahamas has the infrastructure in place that allows for international business, with some 21 international airports, 10,000 acres on Grand Bahama Island earmarked for an industrial and commercial free zone area, one of the deepest harbours in the region and modern facilities connected globally via fibre-optic cable. Additionally, there are world-famous residential communities such as Albany, Lyford Cay and Old Fort Bay, which allow the high and ultra-high net worth families to live, work and play where their wealth is both maintained and preserved. Highly educated workforce: most Bahamian wealth management practitioners attain their degrees from universities in the United States, Canada and the United Kingdom. Taxation: the Bahamas remains a tax-neutral platform where international persons receive the same tax benefits as Bahamians. There are no income, capital gains and inheritance taxes for all residents of the Bahamas. Regulation: the Bahamas adheres to all international regulatory principles and is also active in multilateral organisations established to set and monitor standards for regulation and anti-money laundering and countering of terrorist financing (AML/CFT). In this way all of its institutions continue to have access to the international banking and investment markets. Permanent residency: the Bahamas has a liberal policy for granting economic permanent residency. The minimum residential investment threshold for application for permanent residency is B$500,000; for accelerated consideration an investment of B$1.5 million or greater enables the application to be considered within 21 days. there are no gift and succession taxes in the Bahamas. A key component of the Bahamas' wealth management regime is its adherence to the principle that persons have a right to confidentiality with respect to the conduct of banking affairs. This right has been codified under the Banks and Trust Companies Regulations Act 2000. In relation to requests for information from foreign regulatory bodies the Bahamas will share information only on agreed and transparent protocols agreed to under a tax information exchange agreement (TIEA) reflecting the Organisation for Economic Co-operation and Development (OECD) standard for tax information exchange. In compliance with the OECD standard for tax cooperation between countries, the Bahamas has committed to international standards of international tax cooperation by signing TIEAs with 30 countries to date. The Bahamas has also now entered into an intergovernmental agreement with the United States, signalling its compliance with the United States Foreign Accounts Tax Compliance Act (FATCA). FATCA imposes automatic reporting requirements on all foreign financial institutions relating to their dealings with US persons. The implementation of reporting requirements under FATCA presented certain challenges under Bahamian law as it had to be reconciled with the duty of confidentiality as outlined under Section 19 of the Banks & Trusts Companies Regulation Act 2000 (BTCRA), the Data Protection Act 2003 and the Bahamian Common Law. In many instances, financial institutions have reconciled this conundrum by having their clients provide written waivers of the rights under Bahamian confidentiality and privacy laws that would allow foreign financial institutions to report relevant information to the United States tax authorities. The Bahamas has also joined the growing list of countries that have agreed the OECD's Common Reporting Standard (CRS) for the automatic exchange of information, which the Bahamas agreed to implement in 2017. Following this, the Bahamas enacted the Automatic Exchange of Financial Account Information Act on 29 December 2016 to give effect to the CRS and confer the necessary powers on the competent authority to enter into an agreement with the government of another country for the automatic exchange of financial account information in tax matters. Under the former government of the Bahamas, the Bahamas was to take a bilateral approach to its CRS obligation. However, the new government has taken a different track and has indicated its intention to implement CRS by way of the Multilateral Convention on the Mutual Administrative Assistance in Tax Matters on a non-reciprocal basis. Accordingly, with this wider approach, all financial institutions operating in the Bahamas are now required to collect and retain CRS information and be ready to report it for all account holders and transmit same once notified to do so by the competent authority. disciplinary proceedings in the Bahamas or abroad relating to a lawyer, auditor, accountant, valuer or actuary, public officer or employee of the Central Bank. A key factor for wealth preservation in the Bahamas is that there is no inheritance tax within the jurisdiction. The Bahamas is a common law jurisdiction and its probate and administration of estates legislation is based mainly on the laws of England and Wales. Under the Probate and Administration of Estates Act 2011,10 the Supreme Court of the Bahamas has jurisdiction to make a grant of representation in respect of a deceased person who was ordinarily resident in the Bahamas, or whose estate consists of property in the Bahamas. The court will also issue a grant of letters of administration with the will annexed where a deceased testator owns Bahamian assets but for some specific reason it was not necessary to apply for a grant in respect of his or her will in his or her place of domicile. Traditionally Bahamian courts did not give effect to prenuptial agreements. In more recent times, however, the courts have taken the view that the terms of a prenuptial agreement are a factor to take into account when exercising the court's discretion under the Matrimonial Causes Act 1879. In M v. F ,14 a decision delivered on 7 June 2011 by the Supreme Court of the Bahamas, following the law in the United Kingdom, held that under Bahamian law a prenuptial agreement was merely persuasive and not binding on the distribution of marital assets upon the breakdown of a marriage. The Court held that to give effect or determination to prenuptial agreements the Court must be satisfied that the agreement was entered into freely and voluntarily by both parties with full appreciation of its implication and if it was, whether it would be unfair to give effect to the agreement. An IBC is incorporated under the International Business Companies Act 2000 by two or more persons subscribing to a memorandum that satisfies the requirements of the Act, and may be established for a limited duration. The memorandum and articles must be registered with the Registrar of Companies who will issue a certificate of incorporation certifying that the IBC is incorporated. An IBC can usually be incorporated within a day or two. There is no requirement that a national of the Bahamas be a participant, manager or director of the IBC and there are no restrictions on capitalisation. An IBC may have only one director, and it must maintain a registered office in the Bahamas. on 1 January each year, the IBC must pay an annual fee of either B$350 depending on whether the authorised capital is B$50,000 or less, or B$1,000 if the authorised capital is B$50,0001 or more. Trusts are recognised in the Bahamas and are governed by the Trustee Act 1998. The trust under Bahamian law is a relationship whereby one party (settlor) transfers assets to another (trustee) to be held for the benefit of a third party (beneficiary). Assets transferred to a trustee under trust cease to be legally owned by the transferor and become subject to the terms of the trust. There is no legal requirement for trusts to be registered or for public disclosures to be made. Exchange control regulations do not apply to non-resident settlors, donors, beneficiaries and trustees participating in an offshore trust. An exemption exists in respect of trusts with non-resident beneficiaries, in connection with the payment of taxes, including stamp duty on transfers of property into trusts. Other features of a Bahamian trust include the ability of a settlor to retain a wide range of powers without the trust being declared a sham. Subject to the terms of the trust, trustees have wide statutory investment and management powers, and a protector may be appointed to oversee the trust. The Trusts (Choice of Governing Law) Act 1998 provides protection against forced heirship laws. The operation of asset protection trusts in the Bahamas is supported by the provisions of the Fraudulent Dispositions Act 1991.18 The Act protects the assets of a settlor by placing them out of the reach of creditors who commence litigation in relation to those assets more than two years after the assets were transferred into the trust. Under the Fraudulent Dispositions Act forced heirship laws are not recognised. Persons investing in the Bahamas may use a purpose trust as a component of their investment scheme. A purpose trust can be created for purposes that are not charitable and will not require an individual or corporate beneficiary. The intent behind a purpose trust must be possible and sufficiently certain to allow the trust to be carried out, and not be contrary to public policy or unlawful. Purpose trusts can be fixed or discretionary and unless otherwise expressed in the trust instrument, the trustee may distribute capital and income between different authorised purposes, individuals, corporations and charitable purposes. With the exception of land, and any interest in land, almost any assets can be the subject of a purpose trust. A PTC is a company incorporated under the Companies Act or the International Business Companies Act that acts as trustee only for a trust or trusts created or to be created by or at the direction of a designated person or persons or an individual or individuals who are related to the designated person described within the designating instrument. The establishment of the PTC allows for the trusteeship of a defined class of trusts by reference to the designated person. All other settlors of trusts for whom the PTC acts as trustee must be related to the designated person or persons. 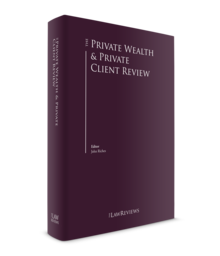 As an alternative to trusts and corporations, wealth management planners may employ the use of a Bahamian foundation. This distinctly European concept was introduced into Bahamian law by the Foundations Act 2004.19 The foundation is best understood as a hybrid between a trust and a company. The foundation will have beneficiaries and may have a protector. It can be established by a will and no forced heirship rules apply. It may be revoked by the founder if provided for in the charter by which it is established. Upon registration, the foundation will be a legal entity, resident and domiciled in the Bahamas with the capacity to sue and be sued in its own name. It may enjoy unlimited duration, subject to the revocation of the charter, winding up, liquidation or being otherwise terminated. The assets transferred to the foundation will become exclusively its assets and shall cease to be the assets of the person who made the endowment. The foundation documents will identify its beneficiaries, which may be individuals, a charity or the public at large. The foundation assets will not become the assets of a beneficiary unless and until distributed in accordance with the provisions of the foundation charter, the articles (if any) and the Foundations Act. The foundation must have assets valued at not less than US$10,000 or the equivalent thereof in another currency. The foundation will have a stated purpose or object that may be any lawful purpose and may, but need not, be charitable. The Foundations Act describes the main purposes or objects of a foundation, including the management of its assets. This may involve the buying and selling of such assets. There is no requirement that a national of the Bahamas or a related state be a partner in a general partnership arrangement. Fees for establishing a general partnership relationship will vary depending on the complexity of the arrangement and will usually be restricted to fees for professional services rendered in connection with advising generally on the partnership and for preparation of documents. A partner in a general partnership will potentially be personally liable for debts contracted on behalf of the firm although as between partners his or her liability may be limited to the proportionate value of his or her share in the partnership. Value added tax of 7.5 per cent is payable on goods and services provided by the partnership where the annual taxable sales of the partnership's business exceeds B$100,000. Over the years, the Bahamas has developed an extensive regulatory regime for private wealth service providers, in order to comply with 21st century international standards, and to maintain its reputation as a reputable international financial centre. With more than 270 banks and trust companies operating in the Bahamas, and the banking industry itself the cornerstone of the country's financial services industry, the Central Bank plays a lead role among the country's regulatory agencies and enjoys full autonomy. Its stature within the Bahamas is reinforced by its long-standing presence in the jurisdiction; the Bahamas, in fact, has been regulating banks and trust companies since 1965. The Central Bank fills the traditional roles as issuer of legal tender, banker to both domestic banks and the government, and regulator and supervisor of the banking sector. As supervisor of banks, the Central Bank promotes the soundness of banks and trust companies through the effective application of international regulatory and supervisory standards. It is a member of various regional and international agencies, including the Association of Banks of the Americas; Offshore Group of Banking Supervisors (OGBS); Caribbean Group of Banking Supervisor; and also serves on the Financial Expert (Mutual Evaluations) Committee of the CFATF. The OGBS has worked closely with the Basel Committee on the supervision of cross-border banking, as well as with the FATF on anti-money laundering initiatives. Continued vigilance is required to secure an effective regulatory environment. Legislative initiatives have been designed to provide products relevant to the international market place, to enhance the regulatory oversight and supervision of the financial service sector, and to further its counter-money laundering regime. These initiatives include a focus on risk management and continually updated AML and CTF guidelines following the publication of revised FATF 40+9 Recommendations. In all, the Central Bank's overall policy objective is the promotion of a stable economic environment conducive to high levels of domestic production, employment and growth. The Securities Commission (SCB) was established in 1995. As part of its endeavour to keep abreast of an ever-changing global regulatory environment, and to ensure a Bahamian contribution towards improving the efficiency and conduct of international markets, the SCB is a member of the International Organization of Securities Commissions – signatory A status under its multilateral memorandum of understanding – and the Council of Securities Regulators. The SCB's mission is to effectively oversee and regulate the activities of the securities and capital markets, and to protect investors, while strengthening public and institutional confidence in the integrity of those markets. The principal areas of focus are the securities industry, including the oversight of broker dealing and securities investment advisory services, and investment fund management and administration. The Insurance Commission of the Bahamas (ICB) is responsible for the prudential regulation of all insurance activity in or through the Bahamas. It is concerned with the ongoing monitoring and control of insurers, agents, brokers, salespeople, underwriting managers and external insurers. Its mandate is to undertake all of the due diligence necessary to guarantee that companies that come to the Bahamas are reputable, high-quality businesses and its supervisory regime is also geared to ensure that it safeguards the interests of the policyholders involved. The ICB has developed a risk-based supervisory methodology, and a principles-based approach that allows flexibility. The Bahamas is a member of the International Association of Insurance Supervisors, which is recognised as the standard-setting body for insurance regulators. It is also a member of the Group of Offshore Insurance Supervisors and a member of the Caribbean Association of Insurance Supervisors. Organisations such as these instil a consistent and frequent exchange of regulatory information that helps the regulator to craft and hone world-class legislation. Like many other offshore jurisdictions, the Bahamas has had to rethink its approach to the development of its international financial services industry. Given the evolution in the financial services industry globally over the past decade, the Bahamas has moved from being a tax-free to a tax-neutral jurisdiction and some have advocated that the Bahamas migrates to a low-tax fully transparent jurisdiction. Initiatives such as these will continue to aid the Bahamas in distancing itself from the perception that has dogged international financial centres of being the jurisdictions of tax cheats and providing a means for hiding wealth. Through its accession to the TIEA regime and compliance with FATCA and adherence to the CRS, while continuing to hold fast to the universal right of privacy of the individual, the Bahamas continues to demonstrate that it is a well-regulated, respected and mature jurisdiction. 1 John F Wilson is a partner at McKinney Bancroft & Hughes. 2 Bahamas Financial Services Board, 'Wealth Management Guide'. Retrieved at: www.bfsb-bahamas.com/guides/files/wealth-management.pdf. 4 Section 84 of the International Business Companies Act. 5 Bahamas Financial Services Board, 'Bahamas Legislative Highlights 2010'. Compiled September 2005. Updated April 2010. 6 The Data Protection (Privacy of Personal Information) Act 2003 provides for the protection of privacy of individuals with regard to personal data. 8 The Bank and Trusts Companies Regulations Act 2000. Retrieved at: http://laws.bahamas.gov.bs/cms/images/LEGISLATION/PRINCIPAL/2000/2000-0038/BanksandTrustCompaniesRegulationAct_1.pdf. 10 Probate and Administration of Estates Act 2011. Retrieved at: http://laws.bahamas.gov.bs/cms/images/LEGISLATION/PRINCIPAL/2011/2011-0001/ProbateandAdministrationofEstatesAct2011_1.pdf. 14 M v. F –  2 BHS J. No. 13. 15 Above, footnote No. 2. 16 International Business Companies Act 2000. See Section 187. Retrieved at: http://laws.bahamas.gov.bs/cms/images/LEGISLATION/PRINCIPAL/2000/2000-0045/InternationalBusinessCompaniesAct_1.pdf. 18 Fraudulent Dispositions Act 1991. Retrieved at: http://laws.bahamas.gov.bs/cms/images/LEGISLATION/PRINCIPAL/1991/1991-0001/FraudulentDispositionsAct_1.pdf. 19 Foundations Act 2004. Retrieved at: http://laws.bahamas.gov.bs/cms/images/LEGISLATION/PRINCIPAL/2004/2004-0023/FoundationsAct_1.pdf. 20 The Bahamas Financial Services Board. Retrieved at: http://www.bfsb-bahamas.com/about-regulation.php.